Ben Stokes celebrates with James Anderson after dismissing Virat Kohli lbw. BEN Stokes took the key wicket of Virat Kohli and finished on 4-40 as England dismissed top-ranked India for 162 to win the first cricket test by 31 runs on Saturday. The 1000th test match for England was evenly balanced as India resumed Day 4 at Edgbaston on 110-5 in its second innings, chasing 194 for victory. James Anderson quickly dismissed Dinesh Karthik for 20 before India rallied again in the morning session. But the match swung strongly England's way when Stokes trapped Kohli leg before wicket for 51, leaving the tourists on 7-141 despite an unsuccessful appeal by the India captain. Stokes broke through in his first over after replacing James Anderson with Kohli playing across his pad. It very quickly got worse for the tourists at 8-141 after Stokes struck again in the same over with Mohammed Shami (0) caught behind. England captain Joe Root gambled by bringing on leg-spinner Adil Rashid to threaten No.10 Ishant Sharma at the risk of being walloped by Hardik Pandya for runs England didn't really have to spare. The gamble paid off immediately when Rashid's googly produced a successful leg before appeal against Sharma, who hit a useful 11, for 154-9. Adil Rashid ended Sharma's innings. India was all out when Alastair Cook caught Pandya off Stokes. Pandya scored 31 off 61 balls with four boundaries but may regret not hitting out more as wickets fell. Allrounder Stokes said "beating a team like India has probably closed a few mouths (of critics)." 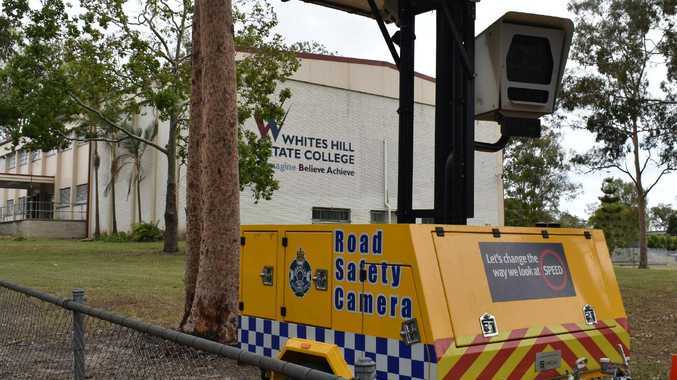 "It will give us heaps of confidence. Winning those tight games, you cannot underestimate what it gives teams for confidence." 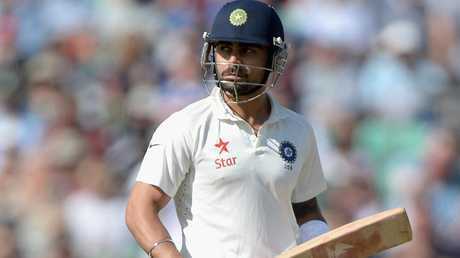 England scored 287 in its first innings, and India made 274 in reply with Kohli hitting 149. India then dismissed England for 180 in its second innings with 20-year-old Sam Curran's 63 keeping the hosts in the match. Fast-medium bowler Anderson had given England a fine start on a sunny Saturday morning but it was not the wicket he told a news conference the previous evening he would go to bed dreaming about. The immediate prize of Kohli was not to be, but second-best was Karthik, ending a troublesome sixth-wicket stand of 34 which had narrowed the margins while England's bowlers tired on Friday. Virat Kohli was out for 51. Dawid Malan took the catch at second slip, partly making up for dropping Kohli on 21 in the first innings Kohli brought up his patient, 88-ball half-century with just his fourth four, and after two more driven boundaries by Pandya in Stuart Broad's next over, England appeared to be running out of time. But it took Stokes just three balls to get Kohli, and another three to shift Shami and leave India needing a further 53 from their last two wickets. 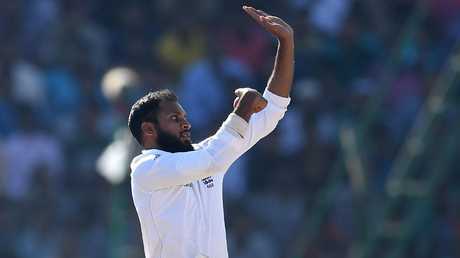 Rashid repaid his fellow Yorkshireman Root's faith to dismiss Sharma with the leg before decision confirmed on review. Stokes, who must report to Bristol Crown Court on Monday morning to answer a charge of affray and will miss the second test, signed off with the last wicket and finished with an overall six-wicket match haul. Anderson took 2-50, Broad 2-43 and Rashid 1-9. "We definitely need to apply ourselves more with the bat," Kohli said. "We've just got to be positive, fearless, enjoy our cricket and try and take the negatives out of the equation, look at the positives and try and build on those. "Definitely could have applied ourselves better but I'm still proud of the fight that we showed and it sets up the series really nicely." The second of five tests starts at Lord's on Thursday. England's first-ever test was against Australia in 1877. In its 1000 tests, England has won 358, lost 297 and drawn 345 matches. It has played tests against nine teams - India, Australia, Bangladesh, New Zealand, Pakistan, South Africa, Sri Lanka, West Indies and Zimbabwe.